It doesn’t matter what each one of us believes about the spiritual world, the Masters of Light, aliens and ancient mysteries, the truth is that as long as we are incarnated, we cannot have absolute certainty on all topics. Therefore, to solve this inconvenient we use the stable datum more than the fact that something is true, because the stable datum is useful to stop the confusion. The base of Grupo Elron is precisely the stable datum. If at any time the stable datum is useful and it’s also found to be true, then it will be better! Many people are asking us evidence about the truth that the Masters of Light revealed. In many cases it’s impossible to give proofs because the person who demands the information is incapable to understand. The messages revealed by the Masters of Light are like lessons published in many pages, and there is no other way to study them, if one really wants to understand what this is all about. In spite of that, many people read one or two pages, and if they disagree with the information they read, they simply criticize the messages because they think differently, they also question the validity of the data without considering a further investigation on the issue. Therefore, the teachings of the Masters of Light are like pieces of a jigsaw puzzle, one can only understand them when the jigsaw puzzle is fully assembled. In conclusion, it is important to remark that Grupo Elron's mission is not to convince anyone of the teachings of the Masters of Light, but only to display them. Then, everyone is free to accept them or not. Warning: Dianetics and Scientology are trademarks and they are mentioned here for informational purposes only. Interlocutor: Master I’d like to ask you about the doctrine of the stable datum, which we take as valid, For instance, to us, it’s you the one who is communicating with us, I have the certainty that you are communicating with us, and also that Jorge translates your concepts and the concepts from other Spiritual Entities perfectly, However, other people don’t have that certainty, then, they can take what we publish or what the Masters of Light say as a stable datum. Ruanel: Correct, the one who disagrees with the stable datum is this vessel, the professor Jorge, He has the certainty, but there are unverifiable certainties and the professor Jorge tries to tell the truth or what he considers the truth is and many times he takes the stable datum leaving aside whether it’s an absolute truth or not. Interlocutor: The issue related to the stable datum, and I know it in my own experience, is that it calms one down, for example that happened to me when I started the communications with you, I had many doubts, first due to the bad mediums before Jorge, but I calmed them down with the issue of the stable datum, you already know that very well. To other people, who do not have the experience we have about mediumship and many other topics. We assume that they take the information as a stable datum. Ruanel: Well, I think that you have already said it. In the physical plane no embodied being has the certainty or the living proof of Eon’s existence, the Creator. Interlocutor: Right, but as a stable datum it works perfectly. Ruanel: Of course, society is ruled by that stable datum. Interlocutor: Yes, but there is a funny thing here, all of us are following the doctrine of the stable datum because nobody verifies nothing, even what the newspapers publish etc. We all take the news they broadcast as though they were true because nobody knows exactly what the truth is. we all don’t follow absolute truths because we don’t know them at all, but we do follow the stable data. 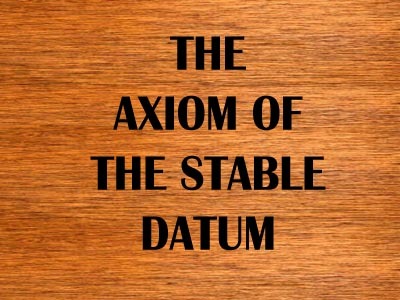 Is there something more to say about the stable datum we should be aware of? Ruanel: Yes, almost three years ago the Master Johnakan revealed that the engrams could modify the DNA of embodied beings  even in gestation, in the mother’s womb, and in accordance to the engram or engrams that are implanted, before it was said that these engrams were implanted at cellular level an actually we know that are implanted ad DNA level. These engrams could change even the physical form or shape of the embodied being. One example is the one related to the Master Stephen Hawking, who decided to incarnate in a body that had already genetic problems, in order to be dedicated to the study of astronomy and astrophysics, however, at the same time, and I believe that this was not said by other Master before. He (Stephen Hawking) was dragging engrams from other past lives because in a previous life he was a very conceited being, a very beautiful being just like this character ‘Don Juan’ from the tale you all know about. and he had many engrams because he ended up alone, abandoned and alcoholized in that life, with an impaired body in his last days and those engrams had an effect in his present life so that his illness was aggravated due to the problem he had as a previous role .Thus, we take as a stable datum that engrams can modify the DNA, but this is not verified outside of the channelings. Email Received Requesting proof from the Masters of Light. Dear Professor: I am writing to you because after reading your web pages, I was a little dubious on some of the answers given by the Masters of Light, but I agree with most of them. That's why I request an irrefutable proof (so that I know) that all the answers are true, what I ask will not be difficulty for your Spirit Guides to respond. I belong to a certain secret group, since I’m a member of a secret society nobody that knows about it (except the other members), at least on this plane of existence. Well, I hope you answer my request responding my question satisfactorily. Dear M.R: I can only smile (with all due respect) when I read the naiveté of your "proof", simply because it’s useless. There is no need to communicate with the Masters of Light to answer your question, because even the lowest and ignorant spirits of error would be able to answer that question, especially if they know how to deceive someone. Many mediums around the world communicate with spiritual entities, but they ignore they are communicating with spirits of error, who are cunningly disguised as Masters of Light. Let me clarify that the spirits of the planes 2 and 3 are called spirits of error, not because they are ignorant, but because they lowered down of plane due to their ego and many of them were Masters of Light who had descended of plane due to their arrogance. Do you know what the spirits of error do in order to be taken into account? They say some truths, and when the medium believes that the communication with the Masters of Light is real, they start giving false information surreptitiously and thus they end up manipulating and deceiving people. However, let’s suppose that I asked the Masters of Light your question and they told me the answer you are expecting. Well, you would not believe me, because you'd think that we've got the answer from your mind through telepathy or any other way. In short, the only way to know if the messages of the Masters of Light are genuine or not is by using common sense: "Common sense is inherent to the truth. If an explanation hurts your common sense, then it’s not true. And it's you who decides." Could you believe me that many people have sent me emails asking the winning lottery number, as a proof that the Masters of Light are saying the truth? In addition, I’ll give you one more fact: When I began this journey, I met a psychic who channeled spirits of error (we both did not know it). I requested a proof to verify the authenticity of the communication, just to be sure that the medium was not deceiving me, I requested that they do something in my house to convince me. Well, I had forgotten this request, when suddenly, while reading the newspaper in my house, the lamps began to move and twinkle. Of course that at that time I took that event as an irrefutable proof that the communication was genuine, but you should have seen how silly I felt when I realized that the spirits of error had tricked me. The spirits of error find it easier to move things in the physical plane by “making focus." The Masters of Light never do that to convince anyone, it would be nonsense. Now if you asked me how I know if a communication is authentic and it comes from the Masters of Light, the answer is very simple: I study the topic thoroughly, investigating all the evidence and the sources to find the possible answers on the plane physical, once I have assembled most of the pieces of the jigsaw puzzle, I asked for the missing data, obviously, if the answer is true it "fits in" as you might say, and then the jigsaw puzzle is assembled. However, if I ask an entity, who says it was Einstein, about relativity, and I have no idea what it is all about, of course I will not know if the answer is right or wrong! Finally, you might wonder how we know that the answer don’t come from the spirits of error. It is also easy to tell: The spirits of error do not communicate, or fail to do so, if they see that the medium cannot be deceived. This entry was posted at Sunday, June 05, 2011 and is filed under Concepts . You can follow any responses to this entry through the .